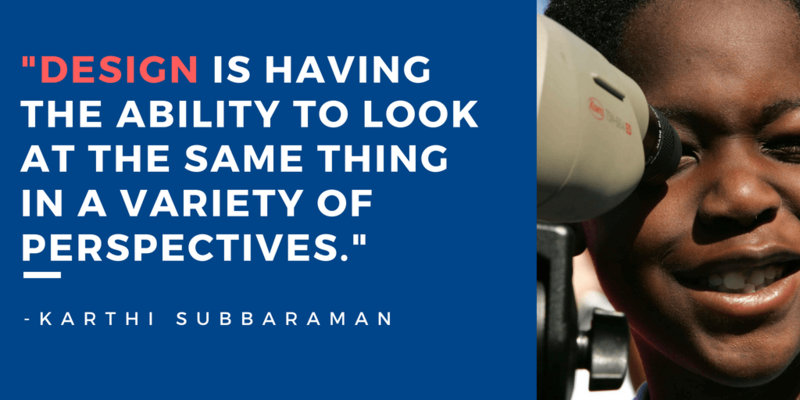 Karthi Subbaraman is a veteran in the UX industry. Having started her career in 2003, she has worked with companies like HP and now working as Chief Product Officer at Xperian. She says, Design is not her passion or profession, but a path she is currently working on. 1) There is a never-ending debate on whether to go for self-learning or to go for a formal design education. What would you prefer and why? Karthi: Education must be transformative. What that means is, if you are educated about something your perspectives about things must change and it must give you a new pair of eyes to perceive stuff. So design education is no exception. Learning is an ongoing process. If you have a roadmap for learning with a structure, you can reach there faster else you will struggle and reach there. Schools give that roadmap. If you can get the roadmap from your mentors or peers go for it. The idea is to put in an effort to transform yourself and your perception. In my opinion, schools give you a structure, network, and teachers. Following that the lifetime learning is yours. If the structure and resources are available with you then you don’t need schools. If you are not self-disciplined than self-learning does not work. Weigh the pros and cons and see what works best for you. For example, I need a structure and I go to schools, take up e-courses, I work with my mentors till date and I guess I will continue forever. 2) What according to you are the prerequisites for becoming a good UX designer? Karthi: A designer is someone who provides clarity in chaos. To be a good UX designer you must be a clarity seeker. That comes when you are curious, resilient, observant and humble. The cup inside must be empty so that you can take everything that comes to you and sort it out and see things clearly. Later pass this clarity to folks around you. That is my definition of a designer. 3) In one of your talks, you mentioned that “design is perspective”. Can you shed some more light on this? An object can be looked from a different perspective. In each perspective, you learn something about that object. Design is having the ability to look at the same thing in a variety of perspectives. The lens with which you look at something is not limited for a designer(or anyone for that matter). When all lenses are brought together, the view is magical. Things that we cannot know otherwise will be known and an insight is born out of it. Nothing is right or wrong, nothing is good or bad, everything is just a perspective. If a designer lives with this attitude he/she can see things the way they are without clouding with personal biases. 4) How would you define your UX journey so far? What all challenges you faced? Design is my life. So your question is asking how has been my life so far  Fantastic I must say! When I look at everything around me as a designer I perceive things differently. So there is no 9-5 where I am a designer, I am a designer 24/7. It surely has made me a better designer to start with followed by a better person, a better problem solver, a better listener, a better writer, better coach, better educator… the design process is followed in every aspect. It is a mindset first and then a skillset followed by a good toolset. In that light, the process works for every problem and my skills get better and better every day. There are no challenges per say. The market is growing in the name of UX/UI and the nascent market typically has a few hiccups and that is what we are facing. Unlike objective sciences, a subjective science like design expects the designer to know more than just design. It is not a challenge it is the nature of the beast. If we can’t make peace with it and up our game as designers we will keep cribbing forever. 5) You started your UX journey in 2003. How things have changed since then? Is it better now or was it better 5-6 years before? Karthi: The core of design has remained the same. Now we have more jargons for the same old things. More people are talking about it. More perspectives are coming out. More books are written about the topic. More adaption has happened, and many case studies are available now. This has made the market more matured and receptive towards design. Other than that nothing much has changed at the core. 6) If ever, you have to start your design career from scratch all over again, how would you do it now? Find the Subject matter experts and their perspectives. Learn continuously through the WWW and network. 7) You are quite active on LinkedIn, Is writing anyway related to better design thinking? Does it help you in becoming a better designer? Karthi: Writing is one of the major tools to think with hands. Thinking is a big part of designing. To imagine stuff that is not existing now but will exist in the future needs a lot of thinking. To do this, there is no better way to imagine other than writing. Even sketching will fall short as not every emotion, feeling, and idea can be sketched in detail but can be written in detail. 8) There is always a buzz about machine learning and AI taking over the jobs. Will there be any effect on UX field? What’s your take on it? Karthi: I so want AI and ML to come in quickly. I welcome them with both my hands, head, and heart. The beauty of a homo sapiens is consciousness. That is something machines will never be able to crack. If things can be handled by machines that allow a man to do more with consciousness why not. Design is all about connecting dots. If more dots can be given for connecting why will we say no to that. I am learning more about AI and ML now so that I can be a better designer. We must know the capabilities and understand how we can impact human lives better and better. Design is directly proportional to Technology. Now technology is growing so designers must be happy. Imagination had no limits and never will have. Now the best part of we can execute also with the growth in technology. Designers must be able to deep dive on capabilities of the machine so that the man-machine equation can be solved better and better. 9) If ever you have to give one single advice to the newcomers in this industry then what would that be? Karthi: Practice design. Don’t get overwhelmed with the amount of stuff. For a problem solver, all we need is just a problem and we have enough. Practice solving problems and the rest will be taken care of when you do it consistently. 10) Tell us something about Xperian. Karthi: Xperian is a first-ever design ecosystem in the planet made for creative problem solvers aka designers. If a business needs to add a drop of design to their company, they can get help with design, designing, and designers under one roof. The same applies to an individual designer as well. If he/she needs any help with learning design, interesting projects his career, Xperian is there built just for the designer. Hope you must have learned something new today. I am taking away that clarity of thoughts is a must-have skill in the design industry. What did you learn from this? Do let us know in the comments section. We are all ears. We are extremely thankful to Karthi for sparing her valuable time for us. Stay tuned for more and want to be a part of UXSprout community, subscribe here. 2. AI, ML is here to help us and they are more of a friend than an enemy to us. Superb takeaways Vrushal. And yeah, As she mentioned, AI and ML are here to stay so, better we go along with that. Like what you want to clear? Can you please elaborate so that we can help? Be a problem solver, period! Spot on. Designing is all about providing a beautiful solution. Thank you for the kind words, Ankur. Yeah, you will see more of such soon. Great content altogether..Not only the Expert views but also the Beginner section is something extraordinary both playing their own significant roles. The Beginner makes you feel that you are not the only one to have such issues and mindsets, thereby making it easier to interact. Loved the concept and the execution. Looking forward to more articles. P.S : Kindly guide me to a subscription button or something through which i can get regular updates. Thank you for the support man. I know that my homies have my back, always. I am trying to work on a better subscription thing. So, will keep you updated with that.